During the network event last weekend 4-5 October we were treated on a very nice exploration of complexity. 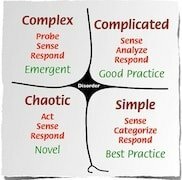 As Perspectivity we say that we are working in complex settings, and we have described some characteristics of these, but still complex as opposed to what? Saturday we explored together with Friso Gosliga and Dave van Mourik from SenseGuide the Cynefin framework – developed by Dave Snowden from Cognitive Edge. It started with an explanation of the difference between the ordered and unordered domains. While in the ordered domains – which are labelled as simple and complicated – we can have good and even best practices because of a proven cause and effect relationship. In the unordered domain – labelled as chaos and complex – we still have to find the answers together. And especially in the complex domain there is a need for new ways of working: and that is where Perspectivity mainly operates! Over seven years we have been active in exploring dialogue and self-reflective learning methods that can take people facing complex situation. Something we are all take pride in and the celebration of this on Friday night, with a special book about 7 years of Perspectivity completely fit that picture. Next event is February 28th – March 1st 2014. Don’t miss it!